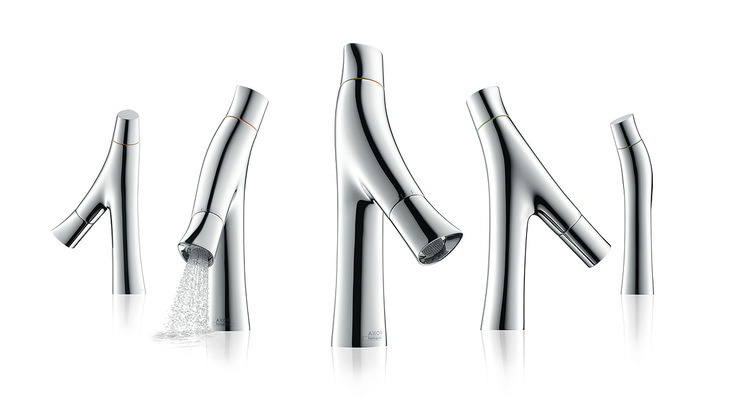 AXOR Starck Organic establishes harmony in design and technology, ecology and economy, heart and mind. Philippe Starck's unique, organic minimalist design has sculptural power, and is governed by this basic principle. Soft shapes and flowing transitions are combined with intelligent functions, while sensuality is combined with ecological value. Harmony also signifies versatility: the design can be integrated harmoniously into a wide variety of bathroom ambiences. To the products in the collection. The broadest ever mixer shower spray offers a highly sensual water experience. Take a shower and let opulent pearls of water bathe your entire skin – incredibly voluminous, and at exceptionally low consumption to boot. With no compromise in terms of functionality or water experience. AXOR Starck Organic represents the next stage in the evolution of mixer control: unlike the classic single lever mixer, which controls volume and temperature simultaneously, this innovative two handle mixer operation is separate – guaranteeing ergonomic movement. 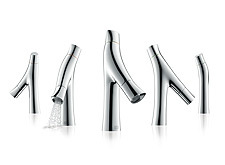 The AXOR Starck Organic design is organic minimalist. The handles visually blend in with the mixer bodies and are ergonomic. The design concept, inspired by nature, is both powerful and sculptural. It sets accents in the bathroom. Water can actually feel this beautiful: imagine standing in the shower with soft droplets of water bathing your entire skin. Incredibly voluminous and titillating. 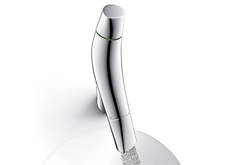 The mixer shower jet achieves this sensual effect using less water than conventional mixers. The innovative two handle mixer means that water is used intuitively, ergonomically and economically. 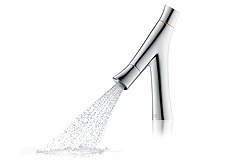 With AXOR Starck Organic, water volume and temperature are controlled separately: the handle for turning on and off is located at the end of the spout, whereas the temperature is controlled at the top end of the mixer. This enables water to be used responsibly and is ergonomically practical.